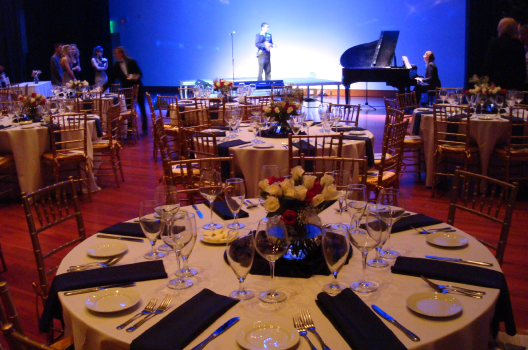 Located on the ground floor, this event space can hold up to 200 people. A winding staircase leads down to the theater lobby, in front of a host of grand windows. An open coffee bar café is located in the southeast corner of the lobby, and has the ability to be transformed into anything your special event might need. A beautiful courtyard is just outside waiting to welcome your guests with a cool breeze and twinkling lights. This Black Box Style Theatre is capable of hosting 500 people. Retractable seating in this space opens the floor to allow approximately 180 guests for a reception or another special event. Included are a built-in large projection screen, projector, audio/visual, special theatre lighting and a weave wall installation (can be covered if it does not suit your event). The Ballroom consists of Suites 1, 2 and 3. Each suite can be used as separate event spaces, or they can be opened to provide one large event space capable of seating 500. With 1500ft of space, Suites 1 & 3 are identical spaces with a 100-person capacity. Perfect for smaller gatherings, corporate meetings and intimate wedding ceremonies. Through a set of double doors, Suite 2 can hold approximately 300 people. A dance floor, stage, and projector and screen are included with this space. Special lighting can be rented.